It locates in the mountain village, Bangli, which still keeps old culture, 2 hours driving from south area of Bali. Kehen Temple is the best place to see in Bangli village. It was established in 11th century, and during Bangli Dynasty, it was treated as the kingdom temple. There are the steeple with reliefs of 3 Gods in Hinduism, Chinese ceramics in the wall, and 11 layers of Meru, etc. I visited this temple for the first time. The temple is decorated with amazing sculptures. 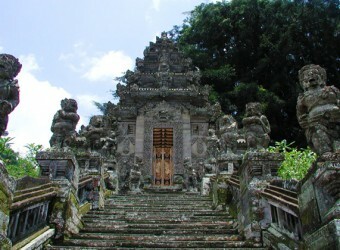 Bali is rich of historical tourist spots. Being able to all temples and world heritage sites is my dream.